A book written by Dawn Koffler and available to view as a PDF or download and save to your desktop. All we ask is that you send us your email address so that we can then keep you up to date with amendments and new material. The information within the book is copyright protected. It is available for download and to share. The handbook covers various aspects of the promotional industry and where branded merchandise fits into the marketing communications mix. The process, from product selection to print techniques and logistics are discussed. Within the appendices, the handbook lists useful information sources, market research from the British Promotional Merchandise Association (BPMA) and a useful project management checklist. Chapter 1 – Promotional Merchandise and Marketing: introduction, industry background, the UK market. Chapter 2 – Strategic Promotional Marketing: marketing tools, key success factors and technology trends. Chapter 3 – The Production Process: artwork, origination, printing, fulfilment, packaging, delivery and reviews. Appendices A-D – industry links, BPMA market research, projects checklist, information on Redbows. 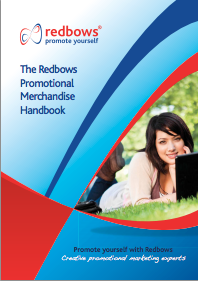 View The Redbows Promotional Merchandise Handbook as a Adobe PDF and save to your desktop. If you would like to suggest amendments or additional content, please call Dawn direct on 0800 158 3080 or email dawn[@]redbows.co.uk with the [ and ] omitted. We request that you respect our copyright. If you wish to reproduce any of the original material and content written by Dawn Koffler (excluding third party market research) we ask that you first seek our permission in writing. For more thoughts and ideas read the Redbows Promotional Marketing Blog. Thank you for reading the Redbows Handbook. Here is some of the content from Chapter 1. Promotional merchandise is one of the most powerful mediums available with which to promote an organization. Branded merchandise has many uses ranging from general giveaways that can help to boost brand awareness to a more strategic role promoting a new product or website and the generation of enquiries and visitors. Promotional merchandise can be used to promote any organization and any for any purpose. Users can include marketers, entrepreneurs, business owners, not-for-profit organizations, public sector hospitals, local government councils, schools, colleges, universities, charities, clubs and even individuals. Recipients can be any stakeholders within the promoting organization: clients, prospects, employees, suppliers, local community, general public, shareholders and members. The term ‘promotional merchandise’ refers to any product or gift branded with an imprint and used within a marketing promotion. The imprint will typically include a logo and sometimes a marketing slogan, call to action, contact telephone number, email and/or website address and be applied through one of various application techniques. These can include: screen printing, lithographic (litho) printing, digital printing, embroidery, embossing/de-embossing, stick on plastic, paper or domed label or engraving. In the UK, the term promotional merchandise is used within the name and title of the two main UK associations: the British Promotional Merchandise Association (BPMA) and PROMOTA, the promotional merchandise trade association. In the US, promotional items, promotional products and advertising specialties are more commonly accepted terms, supported by industry associations including the Advertising Specialties Institute (ASI) and the Promotional Products Association International (PPAI). A list of associations is included in Appendix A.